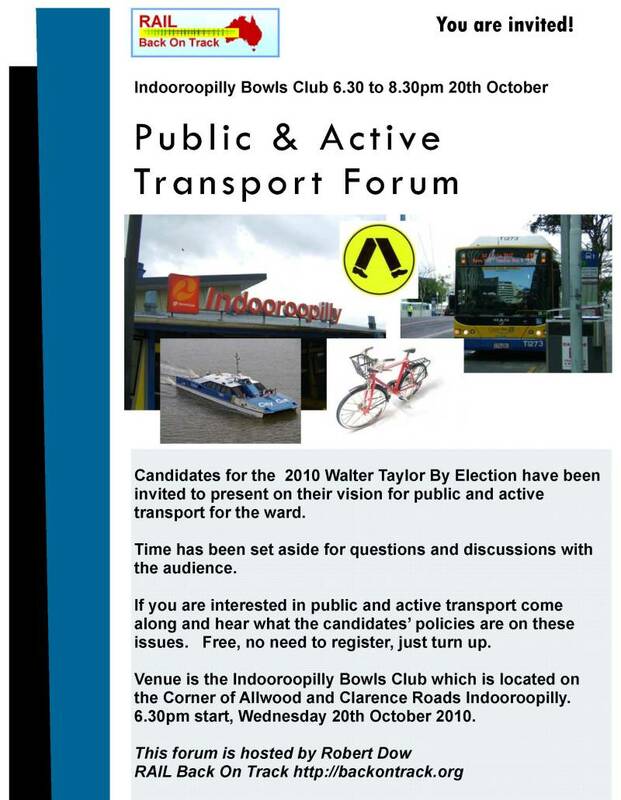 A forum on public and active transport issues in the Walter Taylor Ward is being organised by me for Wednesday 20th October at the Indooroopilly Bowls Club Cnr Clarence Rd & Allwood Indooroopilly, commencing at 6.30pm. All candidates have been invited to attend and present their vision for public and active transport in the ward. Format is for candidates to each present for ten minutes, and then answer questions from the floor. To assist with venue hire a gold coin donation at the door for those willing. Anyone interested in public and active transport is welcome to attend. The Walter Taylor Ward has the greatest public transport trip generators outside the CBD. Bus, rail, CityCat and Active Transport are important to local residents and visitors to the ward. What can be done to improve outcomes for all the community? Come along and find out .. The Greens Candidate Mr Tim Dangerfield has accepted. The LNP Candidate Mr Julian Simmonds has accepted. The Independent Candidate Mr William Borbasi has accepted. The ALP Candidate Ms Louise Foley has accepted. Walter Taylor ward takes in the suburbs of Fig Tree Pocket, Indooroopilly, St Lucia, Kenmore, Taringa and Toowong. Election will be held on the 23rd of October. ECQ Walter Taylor Ward Map click --> here! ... On the policy front, the former Brisbane City councillor said she stood for the future of Australia's cities "not for excuses as to why infrastructure cannot be built or why public transport will not work". "Growth in our cities is inevitable," she said. As former councillor Jane Prentice gave her maiden speech in Federal Parliament yesterday, those jostling to succeed her faced the tricky issue of a new bridge in the Walter Taylor Ward. Both the Liberal National Party's Julian Simmonds and Labor's Louise Foley were wary of plans for a potential new bridge linking St Lucia or Long Pocket and Yeronga when contacted yesterday. Mr Simmonds said he would not support a bridge link unless there was a strong case study proven by traffic analysis. "It does look like one of those long-term things, it doesn't look as if it is going to be built in the forseeable future," he said. Mr Simmonds, who until recently was Ms Prentice's policy advisor, said he was wary of the bridge proposal. "I don't support anything that would increase traffic in St Lucia, or Yeronga for that matter," he said. "I would have to see some pretty conclusive traffic studies to show it would reduce traffic congestion in St Lucia before I would even consider supporting it." Brisbane City Council and the State Government have flagged the idea of a new bridge in their RiverCity Blueprint to provide an alternative to the heavily-congested Walter Taylor Bridge at Indooroopilly. Mr Simmonds said in the short-term, the Northern Link tunnel "will provide a huge difference" and concentrating on extra buses was the better long-term option. Ms Foley said new river crossings has been discussed by civic leaders for almost 100 years. "That is because we live in a city that is split in two by a very large river," Ms Foley said. "And as it grows it is going to become a increasing topic of discussion." Ms Foley said she would only support the project after a large scale community consultation process. "It should only proceed towards any formal decision-making after a major community consultation process in concert with major consideration to major improvements to public transport," she said. Ms Foley, an experienced state government advisor, said she would like to see a "public transport culture" develop in the ward. She also questioned whether council's funding of the $1.54 billion Northern Link project would prevent public transport projects in the city. The Walter Taylor by-election will be held on October 23. I don't understand polyticks... first St Lucia congestion is unlikely to go away. Even when the Eleanor Schonell Bridge opened and buses began overflowing on the Dutton Park side, bus patronage levels on the route 412 bus (then NOT a BUZ) were unchanged. Now BUZ 412 is operating, this might help a bit. I recall reading in the Integrated Regional Transport Plan 1997 that there were 'ideas' for a busway to go from Toowong to St Lucia. Seems like a pipedream now. Perhaps bus priority treatments, replacement of the roundabout on Coldridge Street/Schonell Drive with traffic lights is better? Secondly, they want a new bridge at to 'relieve congestion on Walter Taylor'. But then wasn't there an idea floating around to use vacant land and the army barracks sited next to Indooroopilly station for another bridge, but that was rejected? Northern Link tunnel will speed up buses- if they manage to connect the portal to the INB- but it will also speed up cars. In the off peak hours, will these buses run? It seems like they won't because all the important destinations worth going to are along Coronation Drive and Toowong. Relatively speaking, there appears to be more benefit to cars, especially in the off peak. Finally... I don't think more buses are the long term solution. More buses are the "now" solution. Something with much more capacity is needed - Rail. There really is no hope for this city. More roads to reduce traffic which is an urban myth and more buses stuck in traffic is their long term sutuon. Do they wear blindfolds when they travel or just read glossy brochures of how great the city is when travelling!!! RAIL Back On Track (http://backontrack.org) a web based community support group for rail and public transport and an advocate for public transport commuters has organised a forum on Public and Active Transport in the Walter Taylor Ward. "A by-election for the Walter Taylor Ward is being held on Saturday 23rd October (1). This ward has one of the busiest railway stations outside the CBD, and has a number of other very significant public transport trip generators such as the University of Queensland and Indooroopilly shopping centre. Public and active transport is a hot topic in the ward." "A forum on public and active transport issues in the Walter Taylor Ward has been organised for Wednesday 20th October. 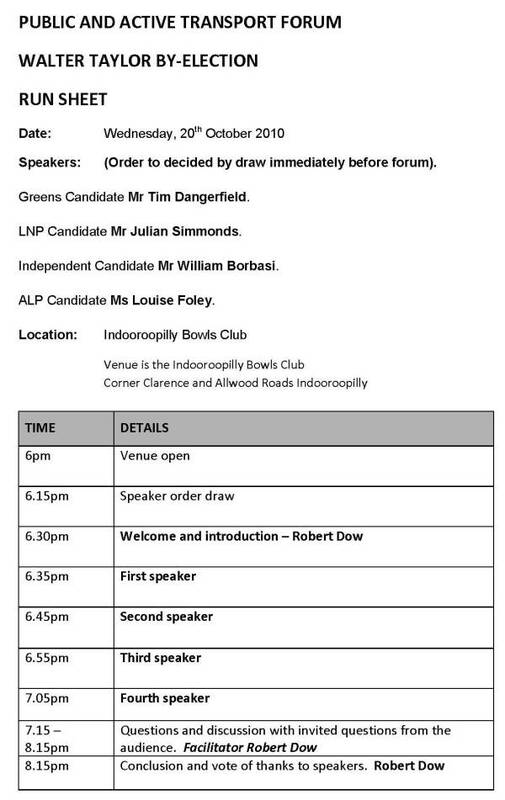 Venue is the Indooroopilly Bowls Club Corner Clarence and Allwood Roads Indooroopilly, commencing at 6.30pm (2). "All candidates have been invited to attend and present their vision for public and active transport in the ward. Format is for candidates to each present for ten minutes, and then answer questions from the floor." "Anyone interested in public and active transport is invited to attend. No need to register, just turn up." All Candidates for the By Election have accepted for the forum. What is scary about this comment is that Clem 7, Airport Link, Northern Link and every tunnel that has gone belly up was supported by some pretty conclusive traffic studies that showed they would reduce traffic congestion. Every traffic study that shows building more roads reduces congestion is pure fiction and belong in that part of the library. Our world would be a very different place if our traffic studies reported the truth that road building only increases traffic congestion. Instead they report what the politicians, road loby and road building industry want it to say." This isn't the first time in Brisbane Planning history that cost/benefit analysis becomes completely unreliable, almost seemingly random and conveniently popping out an answer that fits the government of the day's views. Ideally, a proper cost/benefit would be roughly reproducible, no matter who was contracted to do it. The other thing it should do is come reasonably close to reality. Light Rail: First it was feasible, then it wasn't, then it was, and then it wasn't again. I doubt there is as much pollyticcing going on with these traffic studies as you suggest. The problem with these studies is the number of assumptions that have to be made. You need to come up with a monetary value of time for those caught in traffic to give each route a cost which can either come from previous studies, or if you have the money a large number of interviews with people asking questions. Then theres theres also questions that can have issues with how truthefully people can answer them. Answering "Yes" to whether or not you will pay a toll to drive on a certain new road is often completely different to whether you actually will once it opens. Yep, but that still also asusmes that your data sample is representative of your population. For all you know you could have just questioned the board of RACQ, who would all tell you that new roads are awesome. Equally though you could have only questioned members of this forum and you would get a completely different result. In the end it all comes down to having enough money to ensure your sample size is large enough, and sufficiently random. CBA is meant to get past all of that subjective stuff. The value of time can be approximated from economic studies and projections of income levels can't they? Not exactly sure, but thats not exactly the best way to do it for this sort of thing. You don't want to find out how much someone gets paid per hour of work, you want to find out what the 5 minutes of extra free time is worth to them. They go through the process in a 4th year transport engineering class at UQ (I havn't done it yet) but our lecturer said this year the class average time value was something $17.80/hour. So basically if there was a mode of transport that could get them home 1 hour faster, in theory, they would be willing to pay $17.80 to use it. This can often be different in practice when it comes to actually extracting that $17.80 from your wallet, but you get the idea. They go through the process in a 4th year transport engineering class at UQ (I havn't done it yet) but our lecturer said this year the class average time value was something $17.80/hour. So basically if there was a mode of transport that could get them home 1 hour faster, in theory, they would be willing to pay $17.80 to use it. This can often be different in practice when it comes to actually extracting that $17.80 from your wallet, but you get the idea. Yes, I understand this. It would be something like 50% or 25% of the 'average wage' they would use or something like that. Airtrain. Sydney's Airport Line. Both of these lines have failed to realise their potential largely due to the exhorbitant fares. In Sydney, there was also a proposal about 10 years ago for a private line from Parramatta into the CBD running at proper speeds, not the current snail's pace, which received a cryogenic reception from government and never happened. It doesn't even need to be private. If people want trains now, you could sell bonds to the local councils in that area or increase the fares a bit or see if a special purpose transport levy could be applied. projects much sooner. Maybe an additional fee of 50c? It seems to work with roads- toll roads have been going on in Brisbane since who knows when. Is the idea of special fare zones to fund new infrastructure too radical? Reminder for this forum. All candidates have accepted! Come along and see what the public and active transport visions are! "All candidates have accepted our invitation to attend and present their vision for public and active transport in the ward. Format is for candidates to each present for ten minutes, and then answer questions from the floor." Good attendance (around 60 or so) and all Candidates did a great job, thanks for participating and for those folks who came along. Good questions and discussion. 2. True modal integration needed ( eg. Indooroopilly rail station and lack of bus interchange, true bicycle and footpath connectivity). 3. Proper and effective community consultation - some disquiet with present processes. 3 of the 4 candidates were strongly supportive of light rail as part of the PT mix. The forum held last evening (20th October) in the Walter Taylor Ward prior to the ward by election this Saturday was an outstanding success in terms of highlighting local and broader public and active transport issues in the ward and Brisbane generally. All candidates are to be congratulated on their contributions to forum, well researched and articulate. 1. Bus priority required - the western districts of Brisbane and bus transit is impacted severely by road congestion and minimal bus priority. 2. True modal integration needed ( eg. Indooroopilly rail station and lack of bus interchange, true bicycle and footpath connectivity). With the increase in train frequency on the Ipswich line after the Richlands branch line opens, there is the opportunity for feeder bus to Indooroopilly rail to avoid the road congestion. The failure to properly put in place bus interchange facilities at Indooroopilly rail must now be addressed with some urgency. 4. 3 of the 4 candidates were strongly supportive of light rail as part of the PT mix. Out if the 4 candidates how many had a road obsessed Lord Mayor belonging to their party who thinks that there is no need to change the priority of public transport investment? Which candidate by the way did not think LRT had a role to play? The LNP candidate was not supportive of light rail and cited the Gity Glider as an example of a better option using bus than light rail. Unfortunately it was not appropriate to debate this either way. The initial costs of light rail are often raised as an obstacle but again it is using mode fit for purpose. Yes, it is a bit more expensive to set up light rail but in the longer term in savings in operational costs, carrying capacity, value adding commercial development to the light rail corridor and true transit hubs, light rail in the right environment is a clear winner. One of the reasons why light rail is going ahead on the Gold Coast. The candidates generally understood well the need for integrating and using the right modes, and role of feeder bus to rail heads. I have little doubt that light rail will return to Brisbane. covered in fancy bus wrap, that can be cancelled or diverted or re-routed at the whim of a new administration. Just like the bus lanes in the city- someone new gets in and cancels them. This is what I think is the major flaw in CityGlider. Yes it is an improvement, but why not rattle the money can in front of the developer. Buses below 2-5 minute headways begin bunching up, you need a bigger bus then, and its likely that we will see a bigger bus (arctic?) put on. why is it that when it comes to public transport, anything over $0 is "too expensive". D. Bus Rapid Transit = $4 per km and light rail = $10 per km. And why is it that the operating costs for LRT are 2x higher than for buses? I would have expected them to be lower? The figures quoted I have never really trusted them. The pax capacity of LR is greater, and is actually cheaper per pax overall. That study was designed to support the cheap fix. The City Glider is just another bus route, which in time (if not already) has the same issues as the rest of the bus system as you describe. Greater minds are now at work and once folks see the Gold Coast set up, I am sure will see a more enlightened view. TT, IMO Developers are going to have to start building TODs around bus stops. Probably with a focus on the bigger ones, but still I think if there were plans to re-route any bus route that was running at a frequency high enough to support a TOD would get complaints from the new residents of the TOD, as well as those who currently use it. Once demand builds its highly unlikely that they are going to go "You know what, people catch buses from here, so lets get rid of their bus route" If anything it will more likely be "Lets but bigger buses on" or "Hmmm, what about light rail?" You have a point, but given the experience in West End at the Ferry Terminal & CityGlider, unless the buses are silent Trolleybuses (bus engine noise and emissions spiked the ire of a local protest group), then this idea might have problems. Most of the TODs AIUI are going around rail stations in Brisbane, not busway stops. Trolleybuses have a place in Brisbane IMHO, they should also return to make short work of the hilly routes. I don't think trolley buses are worth it. Your increasing the construction cost by having to put in overhead lines, and removing one of the main benefits of buses in that their route can be changed, in the long term as travel patterns shift and in the short term to avoid closed roads and the like. The Alderley TOD (well, semi TOD) is right next to the train, but given the current off-peak frequencies I think most will find the 345 that also stops there more useful. I would say that while the construction cost does go up, it doesn't go up as high as light rail. It's good for the areas where you want LRT but can't put it due to the slope- parts around Toowong, Paddington, Spring Hill. Yes the capital costs go up, but the operating cost goes down, and the life of an electric bus is also longer AIUI. No exhaust pipe fumes and silent operation would work nicely in areas like West End where people hate lots of engine noise. 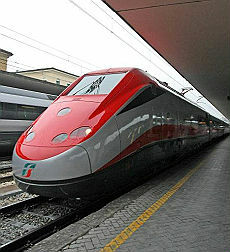 Rail frequencies can be increased- it will take some pushing though. Look at Exhibition, TOD going in there and there aren't even any trains going to that station. There will be in the future though.